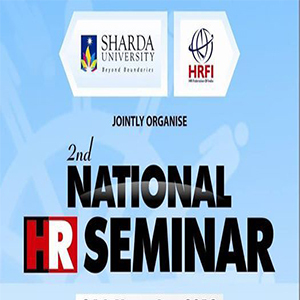 Sharda University, one leading UGC recognized universities in India, known for their focus on excellence in research and innovative academic programs organized a day National HR Seminar in collaboration with Human Resource Federation of India (HRFI) today. The event was organized by the School of Business Studies, School of Engineering and Training and Placement departments. The key objective of this seminar was to provide a platform for interaction among Human Resource (HR) leaders from industry, faculty, and students. The event is also meant to explore & enhance the placement opportunity and industry projects for our students. The event has a distinguished line-up of speakers including Mr. Ronald Sequeria – ED-HR South Asia - GlaxoSmithKline India, Mr. Sandeep Tyagi – Dir. HR - SAMSUNG Electronics Ltd, Mr. Amit Malik - Chief People Officer, Aviva Life Insurance India Ltd among others. The topics that were part of the one-day seminar included Artificial Intelligence & its relevance and impact in HR, Future Workplaces and Employee Experience & Engagement in the near Future. The event concluded with a panel discussion on the topic “Creating an Agile Mindset for Sustained High Performance”. The panel had prominent personalities from the industry including Mr. Girish Nail- Senior Dir. HR- CIPLA Ltd, Mr. Vijay Deshpande - Group HR Head - Deepak Nitrite Ltd, Dr. Rakshita Sharma - Partner & Principal Consultant - Thought Arbitrage Research Institute, Mr. Sumit Sen - HR Specialist, Ex-GM HR HUL, SC HRBP, and Head ER South Asia and Director HR Unilever Ltd (Lead ER) and Dr. Bandana Kedia- Head HR - IFS Solutions India P Ltd.
Over 300 participants drawn from Industry, academia, students and faculty of Sharda University participated in the event.